All four adaptations of the C.S. Lewis children's books using live action and animation to recreate the magical world of Narnia. In 'The Lion, the Witch and the Wardrobe' (1988) it is a quiet sort of day in the English countryside when Peter, Susan, Edmund and Lucy stumble through the back of an old wardrobe into the enchanted land of Narnia and embark on an extraordinary adventure. When the White Witch learns of their presence, their l..
Pribnce Caspian: Wicked King Miraz plans to conquer Narnia, forcing the rightful heir Prince Caspian to flee. With the help of the Pevensie children and an army of persecuted fauns, dwarfs and talking beasts, Caspian goes into battle. With Aslan’s guidance will they succeed in ridding Narnia of this evil force? The Voyage Of The Dawn Treader: Edmund and Lucy return to Narnia with their spoilt cousin Eustace Scrubb. King Caspian needs th.. It is a quiet sort of a day in the heart of the English countryside when Peter, Susan, Edmund and Lucy stumble through the back of an old wardrobe into the enchanted land of Narnia. They embark on an extraordinary adventure discovering talking fauns, friendly beavers, giants and flying horses. When the White Witch learns of their presence in Narnia their lives are in danger, but there is talk that Aslan, the Great Lion, is on the move. ..
Eustace Scrubb and his bullied school friend Jill Pole, find themselves on a perilous quest to find the lost Prince Rilian, aided by their newfound reptilian companion Puddleglum (Tom Baker). Their travels lead them to the Giants of Garfang and underground to the land of the earthmen. Here they must face the fearful Queen of the Deep Realm, combat her magical powers, and break the enchantment of the Silver Chair. 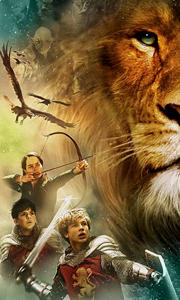 Originally broadcast in..
Own The Chronicles of Narnia - The Voyage of the Dawn Treader / Eragon DVD from Deff, DVD, Blu-Ray & 4K Video Specialists - Free UK Delivery..
Lucy, Edmund and cousin Eustace join King Caspian and noble mouse named Reepicheep aboard a magnificent ship bound for mysterious islands. Soon, they confront mystical creatures and reunite with the mighty Aslan on a mission that will determine the fate of Narnia! Special Features An Interactive Map To Explore More of Narnia And The Secret Islands, King Caspians' Guide To The Dawn Treader, Deleted Scenes, Search For The 7 Swords Match ..